Palm Pre Rumor Mill: Launching Tomorrow? Palm is upping its game with a new budget phone rumored to launch this fall on AT&T. 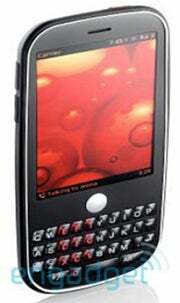 Deemed to be another iPhone rival with a smaller price tag, the Palm Eos (or Pixie/Castle) sports a size 0 silhouette in a candy-bar form factor with a non-slideout QWERTY keyboard. Preliminary specs leaked by Engadget point that Eos will cost $99 (after a $250 rebate) and will come with 4GB of on-board storage (Pre will come with 8GB), a 2-megapixel camera with flash and video capture (3-megapixels on the Pre), A-GPS and Palm's WebOS (which will debut on the long-expected Palm Pre). (Here's a blurry rendering of the Palm Eos from the guys over at Engadget). The Palm Eos is said to be 0.42 inches (10.6 mm) thin and weighs just 3.5 ounces (100 grams). Eos's 2.63-inch capacitive touch screen sports a 320 by 400 pixels resolution, giving it 80 pixels fewer than either the iPhone's or Pre's display. Eos will be a 3G phone (HSPA capable) and extra connectivity comes via Bluetooth 2.1 (with A2DP and EDR - so you can listen to stereo music wirelessly) and a micro USB port (2.0). One thing is missing from the leaked specification so far, and that is Wi-Fi. Now, this might not be such a good sign (remember the BlackBerry Storm complaints?) but for some the removable 1150mAh battery might just do the trick, with a cool four hours of 3G talk time claimed. Palm's new (yet not launched) WebOS will to power the EOS, giving it most of the perks the Pre is expected for. These include SMS, MMS (picture and video only), an integrated instant messaging client, contact sync with AT&T, upper class email (POP3, IMAP4 and EAS support), audio playback of WAV, MP3, AAC, AAC+ (including ringtones) and video playback of MPEG4, H.264 and H263 formats. What's interesting about the Palm Eos is that rumors point it will be launched on AT&T (while the Pre will come exclusively to Sprint). If this is true, then the speculation earlier this week that Apple is in talks with Verzion over sales of iPhone through that carrier might just make some sense. The Palm Eos basically looks like a successor to the company's bestseller, the Centro, with a new twist on the OS powering it. While the cooler Pre (unveiled in January) will be out this summer, Palm still needs a cheap, small and simple device to drive sales from the lower end of the market and keep other partner carriers happy. Palm and AT&T are keeping mum on any other details about the Eos, so it would be wise to take all these leaked specs and device renderings with a pinch of salt.